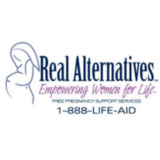 Real Alternatives provides pregnancy and parenting support services and abortion alternatives to women in need. Real Alternatives hasn’t been active on Medium yet. Check back later to see their stories, claps, and highlights.